The Maxxis VIPR Radial Tire is an absolute beast on multiple terrains and it’s easy to see why. The directional tread of the VIPR works along with a radial construction to give you a very plush feeling ride. However, at the same time the VIPR gives you a huge contact patch. And with deep lugs, that means you get traction from the VIPR that excels in loose and intermediate terrain. 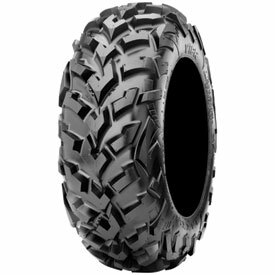 Add the 6-ply rating and rim guard to the Maxxis VIPR Tire, and you have the complete package that’s a superior choice when you need a hard working tire for your UTV or ATV. Great tire for mud, rocks and trails, not the best on bare pavement, little rough, wear is incredible, have not experienced anything close regarding wear, 4000km on new X3 with very little wear on rears and none on fronts, incredible. I do check air pressure before I run each time. I've just purchase a new set of the VIPR's for my Rubicon and they have been great so far. The ride is smooth and the traction is perfect for the trails/offroad I needed them for. I am impressed with the shipping time and the tires. I put the on my pioneer 1000-5. They do well in every terrain I’ve had them in, here in wild wonderful West Virginia. And knowing maxxis I’m sure I’ll get a long life outta them. Bought these tires for my 2017 sportsman 850. I wanted a good treaded tire but not enough to get the death wobble on roads. So far they are one of the best tires I've ever purchased throughout my quading life. They are a little pricey if you go bigger but they are totally worth the penny. We went for a desert ride last weekend, the first ride on our new tires. Never spun the tires, they gripped and climbed the steepest mountains. What a great ride!! The tires seem to improve the handling and ride and they are noticeably quieter than the original tires on the 2015 ACE 570. The tires handle good in the mud and dirt/gravel road. Plus they look good too. Love the look of these tires. 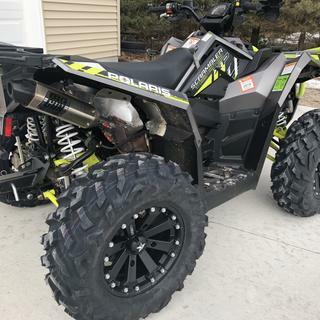 I wanted something that was more aggressive than the stock tires that came on my Polaris Ranger 1000 Crew, but not over the top aggressive. These tires fit the bill perfectly in the looks department. They handle great and seem to have very good traction in loose packed dirt, etc. Haven't had them on long but loving them so far. Service getting them was great. This is a great multipurpose tire. It has deep wells between lugs, but still provides a smooth ride. They're not as smooth as the factory tires that came on my Can-Am, but I think that has more to do with the durability of the 6-ply Maxxis tire (my factory equipped Carlisle tires were punctured by thorns). The ride is fantastic! The tires remove over half the small bumps and washboards. No wonder Polaris is equipping the new Sportsman 1000 with this tire! My neighbor recommended the another Maxxis model, he put 5000 miles on his last set. After talking with Mike he suggested the VIPR and I went with his advise. Great looking tire..lot of meat .. Replaced the tires that came on a Kubota RTV1140 with Maxxis VIPR tires. The ViPR's are superior to the tires that came on the Kubota. Handling is noticeably improved. 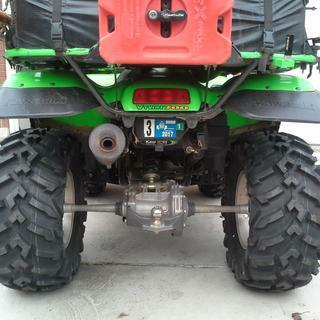 Wish I would have put these tires on when I bought the RTV1140. The ordering process and shipping from Rocky Mountain ATV was great. Received the tires in two days from the time that I ordered. Great product, great price, and great service - what more could you ask for from a company. These tires are the best Maxxis tires for snow, mud, and sand. They also do well on rocks, and are very smooth on hardpack. Overall, WAY better than Bighorns. I'd been running STI Black Diamonds and was very happy with them, but this time around, I wanted an equally capable tire with a different look. The Viprs didn't disappoint. They chew through everything I've put them through. Lateral traction is also superb, as is longevity. 6000+ miles is not uncommon with them. My only complaint is they are really made for sxs so they are a bit stiff on ATV's. If your machine weighs less than 900 pounds on the trail with rider, you may want to go with a different tire. My machine is 635 pounds curb weight and I have to run 1.5 psi front, 3 psi rear to get any sidewall flex. I had Bighorns previously, and thought I'd give the Vipr's a try. They are a good tire - as all Maxxis tires are. I ride on a lot of hardpacked, and rocky trails, but, at times, I am also in soft dirt, or even snow (plowing in the winter). The first thing I noticed after installing the Vipr's was that my gas mileage really went down. That tells me that these tires, and their tread pattern must have a lot more friction as they roll. (Even automotive tires are encouraged to have as little rolling friction as possible - to promote good mileage). Not only has my fuel consumption gone up, but I can tell that my engine is working harder to turn these tires (compared to Bighorns). While these are good tires, I feel that the Bighorns are far superior. They (the Bighorns) ride smoother, with far less friction, handle better, and have much better traction in all, but deep mud - which I stay away from. I'm going to bite the bullet and sell these (new) tires, and I'm going back to my much love Bighorns. (I'm riding a Honda Rincon ATV). I bought these tires for my '09 Can Am Outlander 800R XT and absolutely love them. I did a tire and wheel combination from RMATV/MC and did the ITP SS316 wheels to go with these tires. Awesome combination and looks fantastic on my machine. These tires bite the trails so hard and grab anything in its path with no issues at all. The handle beautifully on both hard pack and soft trails. If you enjoy hard trail riding and want a tire that grips like a vice grip, I would highly recommend them. I bought a set of Vipers to replace my Maxxis Bighorns on the front of my T2 and although they're a little more expensive, I can't say they demonstrate any clear advantage over the stock rubber. They've earned their keep however, when I've(accidentally) hit boulders a few times at speeds that would probably have punctured cheaper tires. I like 'em, but will probably go with DOT tires when they wear out. Bought these after getting flats from rocks on new ranger crew. Handles rocky terrain without a scratch. Rides much better than stock carlisles. Able to climb hills(rocky/sandy) that stock tires couldn't. Been through some light mud and did great but haven't beeen in any heavy mud to rate. We ride the back country in northern Nevada, it's very rocky and sandy. I feel very confident that these tires will get us back from our long rides in the mountains. <br>Had the opportunity to get in real heavy mud and about 6 inches of snow. Tire performed great. Very good looking tire that really performes on dirt roads and rocky trails. Doesn't tear up the yard or pasture unless you get on it and ride is much better than the aggressive mud tires. Unless you do most of your riding in deep mud I would definately recommend these tires. Machine this part was bought for: 2014 POLARIS SCRAMBLER XP 850 H.O. Bought this tire originally to put on a Renegade (bigger tire than stock), but after deciding to upgrade to a Commander these tires made for the perfect upgrade over stock. Handle's mud great, dirt trails are no problem, haven't used them much in a "rocky" situation, didn't change the ride in regards to comfort or tire noise on pavement. Tire does leave marks in the grass on slow speed sharp turns that original's didn't, but not bad just shows the tire is getting good traction. GREAT Tires, definitely recommend! I see a lot of people running the same size tires on both front and back of their RZR , I'm new to the side by side world and to get started I picked up a 2013 RZR 900 4 passenger , it had a 5 inch lift on it and I didn't like the angle of the axils so I dropped it 2 inches. The guy kept the 30 inch tires and put the stock 26/12/12 & 6/9/12 bighorns on. I have 3 inches of clearance to the running boards in the back and 3.5 to the back of the fender in the front. Although I dropped it 2 inches to leave the axels a little I can get clearance back with 28 inche tires. In northeast Ohio we have everything as far as mud, mountains and I live out in the back country so dirt roads are the normal travel. So far I've come to the Viper and 14 inch beadlocks, would you go same size all the way around or bigger on the back and smaller in the front...? MAKE SURE YOU KEEP THE SAME SIZE TIRE, AS FAR AS DIAMETER ON BOTH FRONT AND REAR. THIS WAY YOU WILL NOT DAMAGE THE GEARING OR TRANSMISION FROM TWO DIFFERENT SIZE TIRES, TURNING AT DIFFERENT SPEEDS. About 25% of the riding we do is on paved roads to get to the trails. How do these tires feel, perform, and sound on the road? Do the wobble , wander or vibrate? Are they quiet? How is tread ware? BEST ANSWER: I have not experienced any wobble, vibration or excessive noise. They may be a little loose on hard packed surfaces and work best in moderate mud or softer conditions. They tend to run on center ridge of tire if installed on narrower wheels. I've racing cross country with them and find them to be an excellent tire for varying conditions and durability. However, I would not recommend for soft sand such as dune riding. They wont offer much floatation. Tread is aggressive and wears well. I don't do much hard surface riding so I can't answer that question specifically. I have not noticed any noise or vibration of any kind, They have excellent traction and tread wear so far is nominal. On my commander I have none of the negative issues mentioned in the question. I have 28” and they hold up very well. All good even at 65 mph. I’m on the blacktop often. How deep are the lugs? How much does the 27s weight? BEST ANSWER: I'm sorry not sure what they weigh I have 26s but love them ride nice & even in some mud I don't even use 4wd just keeps going. What is the weight of the Vipr in 26x9x12 and 26x11x12? BEST ANSWER: I found three different web sites that sell this tire and the average for all three is 24 lbs for the 9 wide and 28 for the 12 wide. Not sure about the weight. You can contact customer service at ROCKY MOUNTAIN ATV/MC. I am sure that they will be able to help you. I would guess at about 8 lbs. Never thought about it. Will these fit on my 2017 Stock Honda Rancher 420 4x4 rims? BEST ANSWER: After 3500ks I replaced my stock 26x8-14 front and 26x10-14 rears with 27x9-14 front and 27x11-14 rear, Maxxis VIPR,s to my stock rims with a great result. This is on my Polaris Sportsman 850XP EPS 2012. I now have close to 8000ks and they are only performing better. BEST ANSWER: You have the same chassis as the 1000 Sportsman and the tire size you are asking about are the standard size on the 1000. I have these tires on my 2011 850LE and love them, much better than the Carlisle that came on it! Adam. Have a 2017 Sportsman also. No need for any mods with these tires. Look & handle great. You won’t regret this upgrade. 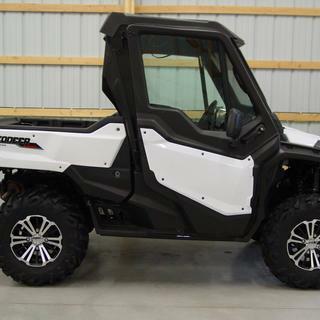 Just got a canam outlander 850 base model, I wonder if a 27x9x14 would fit under the front of my atv without rubbing on a aggressive ride in the woods of pennsylvania? Also putting 27x11 on the back as well. Will the 29” tires fit on a 2012 Ranger 800 crew without a lift? BEST ANSWER: Sorry I have a pioneer 500 I went one size bigger 26 from 25 with no problem. BEST ANSWER: These have a 6-ply rating.